It’s important to mention that ultimately I had very little control over how much weight I was to regain. I knew what weight I wanted to be at (175 lbs seemed like a great number for me). But when I weighed a 125 lbs there was very little I could do to control that outcome. However, for the most part I was able to control my behaviors. Each day I had much more control over when, how, what I ate than whether or not I’d ultimately weigh 175 lbs or 172 lbs or 168.4 lbs. 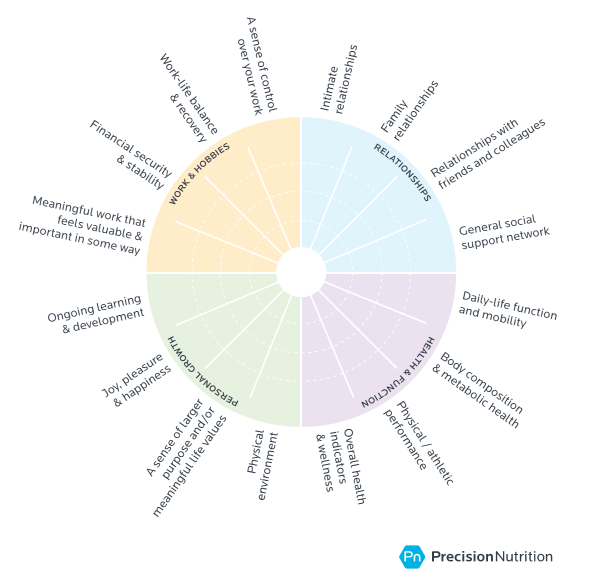 The interesting thing was that when I started focusing more on improving the nutrition habits that I could control the outcome (weighing a certain weight on the scale) became less important. Those are behaviors that I have much more control over. The nice result is that the outcome usually takes care of itself and I find myself hardly preoccupied by some arbitrary number on a scale now. What behaviors are helping you get closer to your current goal? Can you do more of that behavior? What would that look like? At this point in the book you should have some good information about yourself. How you feel and how you practice good nutrition. You might have started to notice a few trends and possible discoveries about yourself. With that information I’m guessing that there may be a specific habit you’d like to improve upon or begin to work on. Go about that improvement by picking one of the options below. Remove the “big log” first – what is the one habit change that you can do that would have the biggest impact on your health and nutrition? Start with the “low hanging fruit” – what is the one habit change that would be the simplest and easiest to change right now? Your personality, and the option above that resonates more with you, will guide your choice here. There is no “right answer”, simply pick the one that feels right to you today. Some people like to remove the “big log” right off the bat. That’d be something like going from eating fast foods 5 times each week to only eating organic foods every day. Others are more comfortable with starting off with the “low hanging fruit” or easiest habit to change, like replacing a decent habit with something just a little bit healthier. For example, instead of eating a generic, sugary bowl of cereal with milk you could easily replace that with an organic cereal and blueberries with almond milk. You’re already eating the cereal but this time it’s a little healthier. You can’t make an incorrect choice here. Both options are great. Go with the one that feels right to you. Try this: Decide between the “big log” or the “low hanging fruit”. Then adjust your actions accordingly. Reach out on Facebook if you’re feeling stuck. Are you a professional athlete that has a team of nutritionists, chefs, and staff to help you? I’m guessing not, so I’d suggest you not try to eat like one. It’s more likely that you are recovering from an IBD diagnosis/flare and simply trying to feel better? Trying to eat or train like any professional athlete is a fast way to feel inadequate and overwhelmed. So assess where you are right now (hint, most people are more beginner than they may think). This level is ideal for nutritional beginners. We can be advanced in movement and athletics and still be nutritional beginners. It’s more ideal for those with more modest goals, such as moderate body composition improvements, or feeling better every day. This level requires simple, basic instructions and steps. This level is appropriate for recreational exercisers and high-performance athletes who already have a high-quality basic diet and want to pursue very specific performance and/or body transformation goals. It’s also a good level for those clients who really want and need to know the details of their intake. At this level, you can handle activity and goal-based calorie calculations, body type-specific macronutrient breakdowns and nutrient sensitivity-based timing strategies. Assess where you are right now. Are your health and nutrition habits matching that situation? If so, great! If not so much, could you do just 1 thing today that would get you back in alignment? What would that look like? 14 days, 21 days, 40 days, etc, etc. Many popular fitness or nutrition challenges are tied to a preset number of days. But what happens on days 15, 22, or 41? If you ate (insert popular health food trend) daily for (insert # of days) then you should be all set for a healthy life from then on. But with IBD we need to find solutions that work for both the short and the long-term. We are not looking for a short-term burst of intensity with your nutrition habits. You want to be in this for years. You are looking for consistency and sustainability, not defined by a preset number of days. I must address a bit of inconsistency on my part here first. I’m writing a book about 52 habits to improve your nutrition and strength with IBD. It’s basically 1 habit each week. Isn’t that a short-term approach? It depends…and this is a frustration in the fitness industry. So I advise you to absorb all of the previous habits on mindset, values, and identity. See who, what, and how you’d like to be with your IBD. Then find easy habits that you can practice for a sustainable amount of time with consistency. Keep reviewing this process and your health, well-being, and strength levels are better able to improve. Take a deep breath and simply absorb the main point here. Consistency is the key. Keep practicing your habits and slowly, but surely you’ll find the results you’re looking for.